As a follow-up to my previous post, I will chronicle how I save the bounty of persimmon season, thanks to my generous friends, and make a tasty treat that can be frozen and enjoyed in later months when persimmons are no longer available. I used the astringent hachiyas this year, since that is what I received (they are also less expensive if you have to buy them yourself). You can go through the exact same process with the fuyus as well. The good news about drying hachiyas, is that even squeamish friends and family that don't like the mushy texture of a ripe hachiya, may enjoy the dried version. You process both types of persimmons when they are hard. (If you are making fruit leather, which requires a special tray or plastic wrap, then the ripe ones might work. I have not tried that...maybe next year). 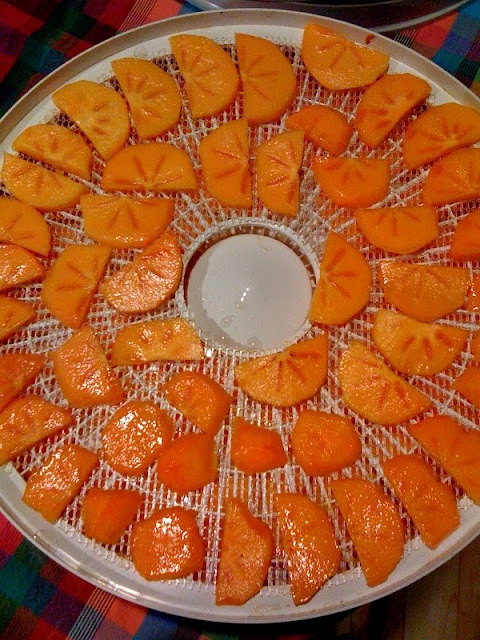 I use a dehydrator. You could theoretically do this with just screens and sunshine I suppose, but it would take longer. I like being able to finish a batch in about a day, and I don't worry about mold or pests getting at my tasty fruit. I was taught by a friend to peel, then slice the fruit into 1/4 inch thicknesses, then dump them into a bowl filled with cold water and a shot of lemon juice. Orange juice will do in a pinch. The citrus is to keep the fruit from darkening or turning brown--but I actually kind of like the darker orange color. I suppose I might care more if I was drying apples where the brown might look more like the food had gone bad. The lemon juice has no impact on the taste. I LOVE the new screens I bought last year that sit on top of my trays. They are flexible, making it easier to peel off the fruit, and also easier to wash in my non-industrial size kitchen sink. I want to get more screens and trays so that I don't have to wait between wash cycles to get my next batch drying. The key to drying fruit successfully is to check it every couple of hours by hand. In my first few tries, I left my dehydrator running overnight. When I woke up, much of the fruit was so hard, they felt like plastic. Instead, you want to flip the pieces over every couple of hours, so they dry evenly, and don't stick to the tray as much. The fruit is done and ready to bag when they feel completely dry on the outside, have no squishy sections, but are still slightly flexible. You don't want the pieces to get too hard or brittle, as you lose some of the sweetness. See below for a completed batch. On the other hand, if you do not dry them enough, the hachiyas will still be astringent. I am done processing all the persimmons received so far, except for a bowlful that I plan to allow to ripen and eat. YUM. 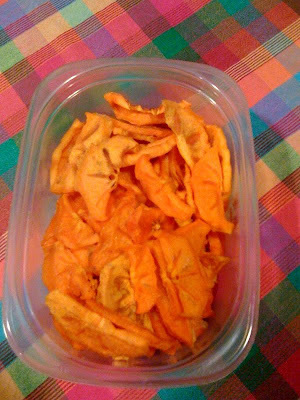 I am continually amazed at the people I meet who have persimmon trees, but do not know about drying them. Looks like you can even dry them in a regular oven. There are other ways to dry, which require less slicing. The fruit can be dried whole--the process is described on this site, which also includes persimmon recipes and reconstituting instructions. Here is an interesting social tidbit--Koreans, Japanese, and every West Coast Chinese I have ever met were familiar with both types of persimmons (kam in Korean). However, I found that two Canadian-Chinese families I met had never heard of the fruit. I think they were multi-generational East Coast Canadians, so maybe that has something to do with it. I was very surprised to meet any Asians who were not familiar with this fall fruit. Their loss, my gain! Those look fantastic. They were so good fresh, I can only imagine how good they are dried! I'll bet they'd be great cut up & in a bread or cake too. Perish the thought--I only eat them unadorned to maximize their persimmon-y goodness! But you are probably right, they would be tasty in place of any other dried fruit.